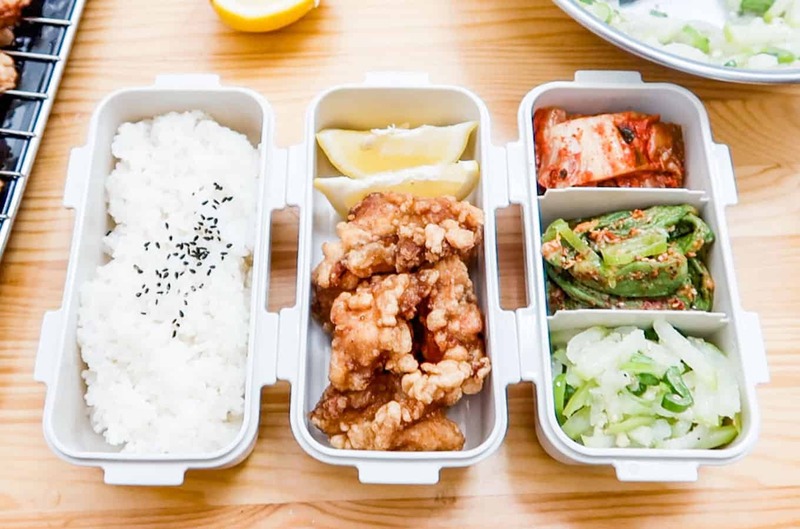 This Karaage chicken recipe is pretty much fail-proof. The only thing is to allow enough time for the chicken to soak-in the marinade. Give at least one hour in the refrigerator. In the recipe video, I also use a few shakes of ginger powder. You can also substitute this powder with freshly grated ginger – 1/2 teaspoon should be enough. The first banchan is called Mu Namul Jorim (무나물조림). 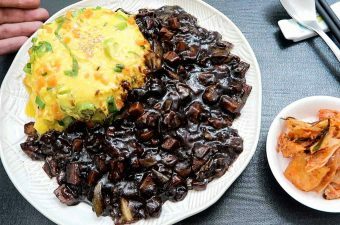 In Korea, you’ll find it served as an ingredient in Bibimbap, but it also tastes great on its own. 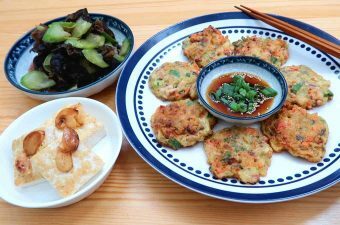 This banchan is very healthy and takes less than 15 minutes. If you’re cooking it for the first time, I would recommend following our portion size. That way, you know what it should taste like and then you can make it in larger batches afterwards. Feel free to fine-tune the seasoning to your taste-buds. 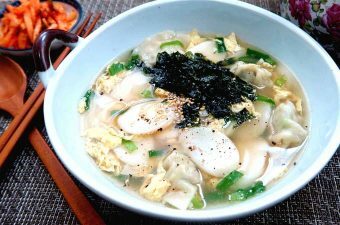 The second banchan that I refer to in the video is Gwali Gochu Muchim (꽈리고추무침). You can find my mom’s recipe here. Gwali Peppers are hard to find outside of Korean markets, so you can use okra instead. 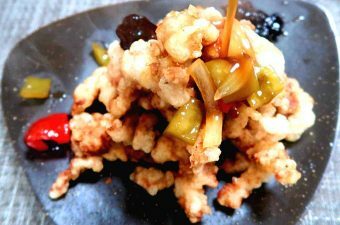 This banchan works very well as a side dish to meat-y main dishes. If you try making it at home, snap a photo on IG and share with us! 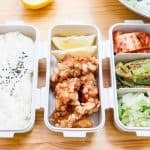 Cut chicken thighs into bite-sized pieces (keep skin on). Place pieces into a strainer and give a quick rinse under cold water. Then set it aside for a few minutes and let it drip-off the excess water. Afterwards, place into a mixing bowl. Add the following ingredients into the mixing bowl: Soy Sauce (2 Tablespoons), Salt (3-4 shakes), Sugar (1 teaspoon), Mirim (1 Tablespoon), Black pepper (few shakes), Ginger Powder (3-4 shakes or 1/2 teaspoon of freshly grated ginger). Give a thorough mix. Place plastic wrap over the bowl and place in the refrigerator for 1 hour. 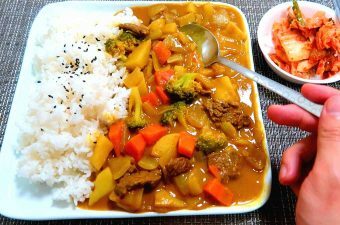 After 1 hour, take it out of the refrigerator. Crack in one egg into the bowl. Then use a pair of chopsticks and gently stir-it into the mixture. Take out a plastic bag (or ziploc bag). Pick-out each chicken piece from the bowl and place into the bag. (Don't dump it in - we don't want all the liquid). Put oil into a frying pan or pot. Place on medium-high heat and bring the oil up to 180C (350F). Now, gently place each chicken in and cook until dark-golden brown. Optional: You can pick-out the chicken when they're about 80% done. Raise the temperature of the oil and place back-into the oil for a double-fry. It leads to an even crispier skin. Cut off a finger-length piece of Korean Radish. (It's better to use the green part because it's sweeter). Then cut the piece into thin cross sections and then julienne into match-stick pieces. Slice spring onion piece into thin pieces as well. Take out a large pot. Place-in the Korean Radish pieces. Then put in some amount of water (1/4 cup). Now, place the pot on a high heat and bring it up to boil with the lid on. Once it comes to boil, reduce the heat to a medium-low. Then take off the lid and season with coarse salt (1 teaspoon). Place the lid back-on and let it cook for 1 minute (or until the radish turns soft). Now, place the cooked radish pieces into a mixing bowl. Add-in the spring onion pieces. And finally the seasoning: Minced Garlic (1 teaspoon), Perilla Oil (1/2 Tablespoon), Ginger Powder (few shakes), Black Pepper (few shakes) and Sesame Seeds (few shakes). Toss throughly and serve it up. Eat with rice and enjoy!